What it’s about: Reader Omri Rosen suggested this week’s entry, about the only Japanese passenger on the Titanic. He survived, but while American survivors like last week’s entry Margaret “Molly” Brown were hailed as heroes, Hosono was publicly scorned for not going down with the ship. Strangest fact: Hosono was traveling from Russia to its direct eastern neighbor, Japan, by going west. Hosono was a civil servant working for his home country’s Ministry Of Transportation who had traveled to Russia to research that country’s railroads. 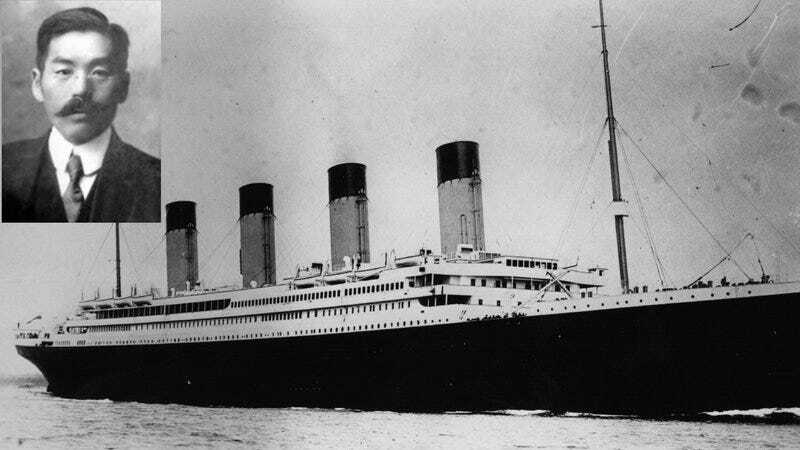 His work completed, he traveled home via London, and intended to take the Titanic to New York as the next leg of his journey. It’s not clear whether he had further business in the west, or with the Trans-Siberian Railway four years from completion, it was easier to cross Europe, the United States, and two oceans than to travel from one side of Russia to the other. Biggest controversy: Initially, Hosono was celebrated alongside other survivors. An American newspaper ran a story on the “Lucky Japanese Boy.” (As Hosono was 41, “Boy” seems to be racism typical of the era.) But he was soon condemned both in America and at home for not honoring the ethos of “women and children first.” A best-selling book about Titanic survivors described him as a “stowaway” on the lifeboat, and the seaman in charge of the lifeboat told the U.S. Senate he must have disguised himself as a woman to sneak on board. Neither account was true—by his own account, Hosono saw other lifeboats depart and mentally prepared himself for death. But as lifeboat 10 was loading up, someone shouted “room for two more!” and Hosono followed another man on board. It’s hard to imagine anyone else would have acted differently in the same situation. Thing we were happiest to learn: Hosono did have the opportunity to tell his own story. After the survivors rescued by the RMS Carpathia, Hosono discovered he had an unfinished letter to his wife still in his pocket. He used the paper to recount his experiences, and his account was published several times. But the negative press got more attention. Thing we were unhappiest to learn: As nasty as the U.S. media was to Hosono, things were no better at home. The Japanese press called him a coward and he lost his job. Even as late as 1997, when James Cameron’s film Titanic renewed interest in Hosono and other survivors, there were claims that Japanese textbooks were using him as an example of immoral behavior. (This claim also seems to be apocryphal.) Fortunately for Hosono, the Transportation Ministry quickly realized he was too valuable to let go, and he was re-hired. But the stigma dogged him for the rest of his life. Also noteworthy: American analysis of Japan’s treatment of Hosono focused on the idea that he was shunned for not adhering to some “samurai code” of self-sacrifice. But in fact, the notion of “women and children first” was a Western idea that had become popular in Japan via Scottish author Samuel Smiles. His 1859 book Self Help was a huge hit when translated into Japanese, and is credited with exporting European values to the country. Best link to elsewhere on Wikipedia: Hosono’s reputation was largely restored in the 1990s, when his family released his letter to his wife publicly in the wake of Cameron’s film. His story in his own words is far more sympathetic than the slanders he had endured through the media. Hosono’s grandson, Haruomi, said the family’s “honor has been restored.” The younger Hosono found fame on his own as a member of Yellow Magic Orchestra, an innovative electronic music group that’s been recording and performing on and off since the late ’70s. Further down the Wormhole: Hosono’s traveled in Russia only a few years before the Russian Revolution that marked the end of the Russian Empire. Historians consider the start of Imperial Russia to be Ivan III wresting a vast amount of territory away from the Golden Horde, the descendants of Genghis Khan who ruled the northern part of his empire. Khan built the largest empire in world history, but after his death, it fractured into four sections, ruled by different branches of his family—the Golden Horde ruled much of modern-day Russia; the Yuan dynasty ruled China; the Chagatai Khanate ruled Central Asia, and the Ilkhanate ruled modern-day Iran and much of the surrounding lands. The various factions fought each other and internally until the great Mongol Empire was in ruins. But 250 years after his death, an exiled widowed queen rose to unite a shattered empire and became a warrior so fearsome the Chinese built a Great Wall to keep her out. We’ll hear the legend of Mandukhai next week.